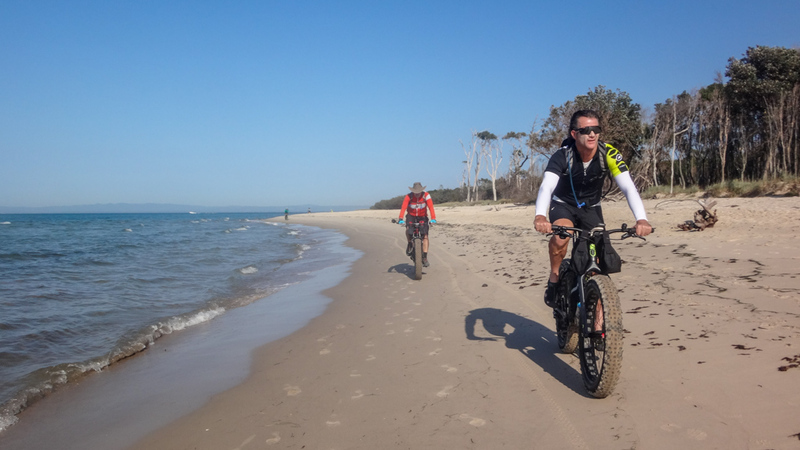 Today we rode our fat bikes along the shoreline of Bribie Island for as long as we could, before the tide came in. 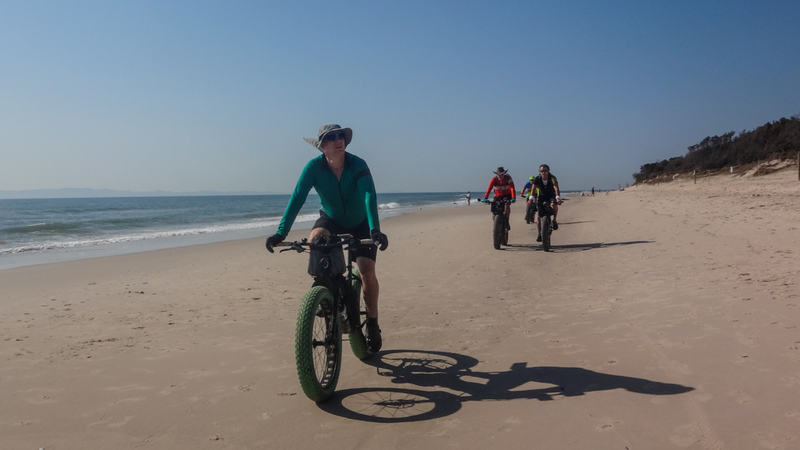 We rolled onto the sand at Bongaree, and followed the shoreline southwards. The tide was still receding, leaving numerous puddles for us to splash through. 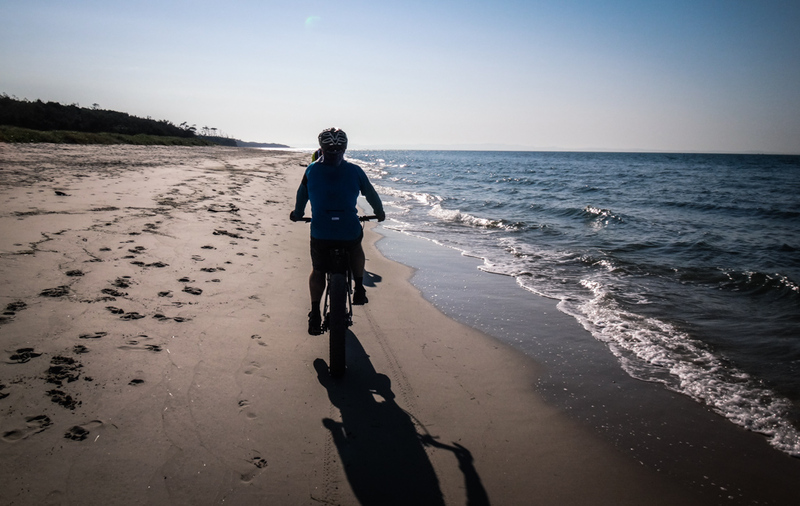 The best time to hit the beach for a long ride is about three hours before the low tide. 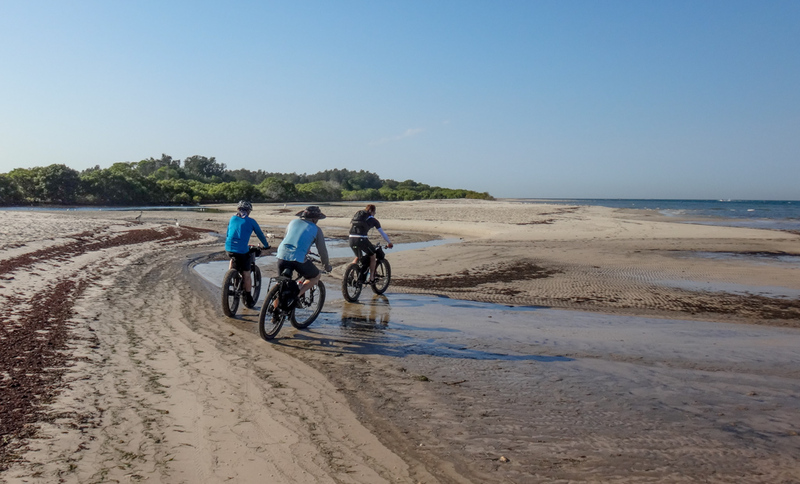 As the tide fell, the beach slowly widened, leaving a small corridor of hard wet sand on which we could easily pedal. If everything went well, we’d have about five hours to enjoy the beach before the tide came back in. Red Beach is delightfully secluded. A thick paperbark forest grows down to the high-water mark, which makes progress almost impossible at the top of the tide. 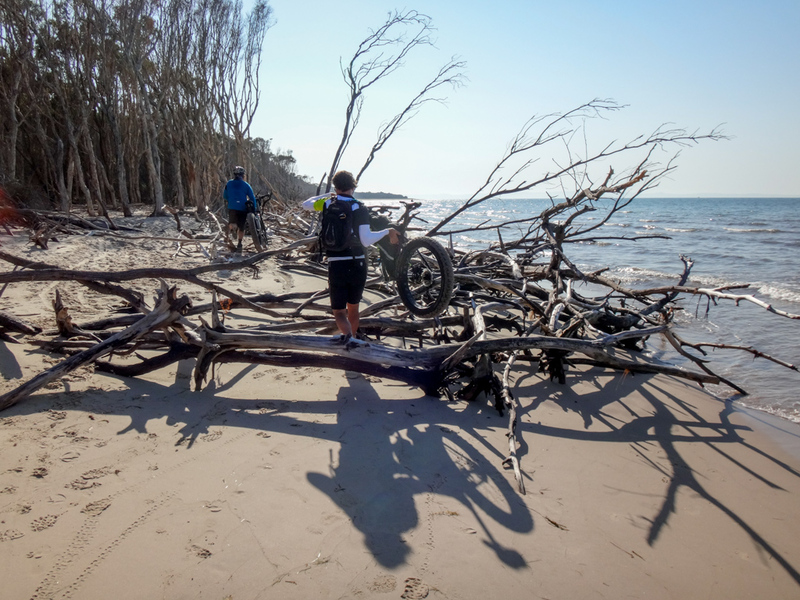 The narrow margin of hard wet sand forced us to clamber over fallen trees. 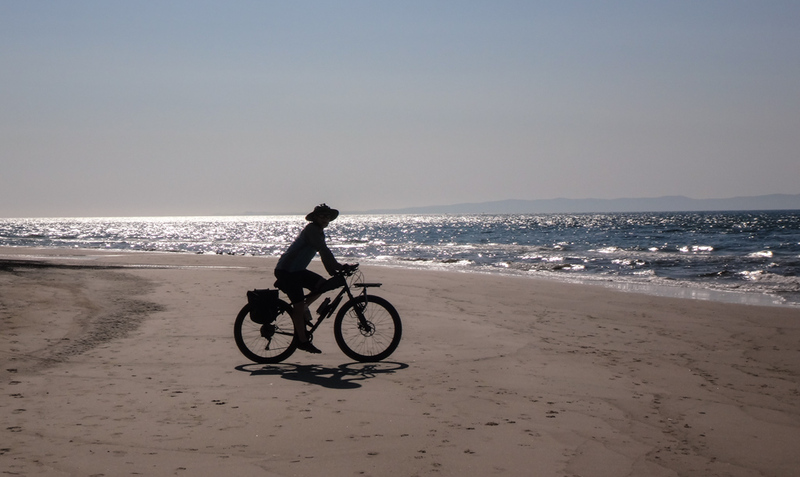 We rolled eastwards, not having to share the beach with anyone. This is a fascinating place historically. 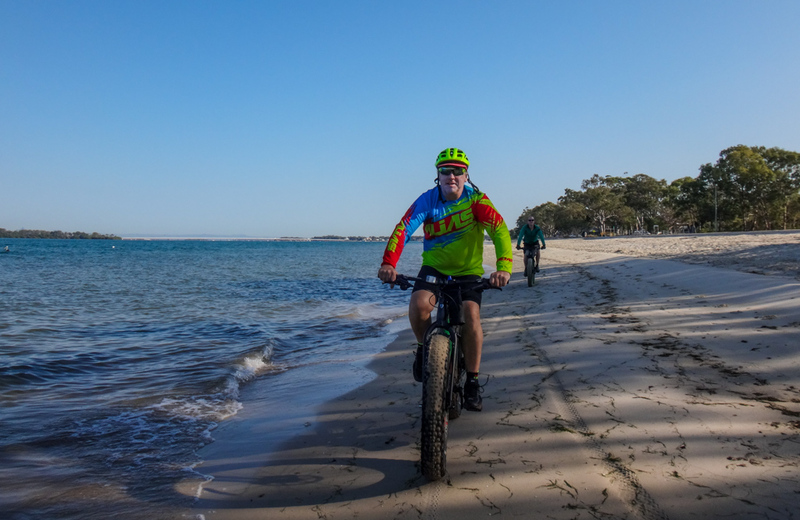 In 1799 Matthew Flinders moored his ship off this beach and rowed ashore. He met some local Joondoobarrie people, one of whom was very interested in Flinders’ hat. An argument broke out, forcing Flinders to retreat to his ship. While this was happening, the man who failed to secure Flinders’ hat threw a spear at him. Flinders retaliated with gunfire, injuring the man. Twenty-four years later, John Oxley moored his ship in the same spot. Looking at the shoreline he saw some agitated aboriginal people standing on the beach waving wildly at him. When he looked closer, he noticed one of the men was white. 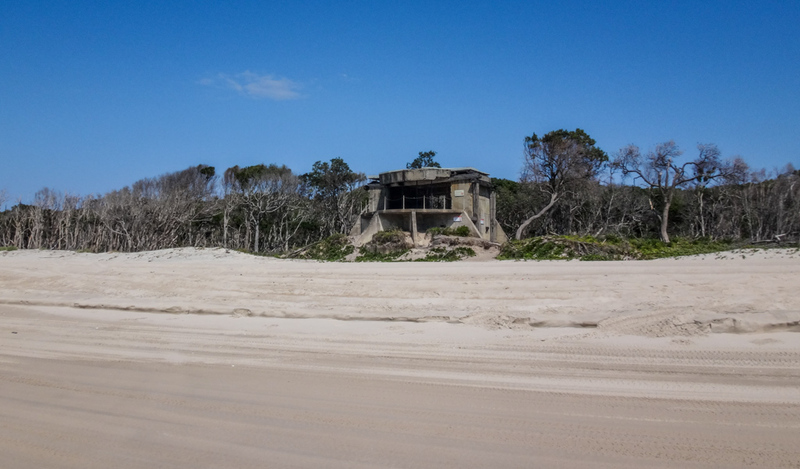 The castaway, Thomas Pamphlett, had been shipwrecked on Moreton Island six months earlier with two other men. 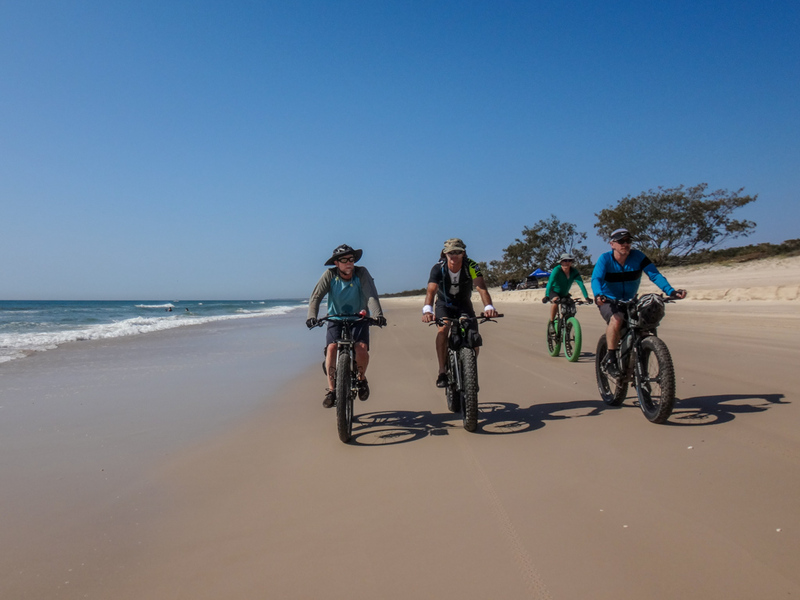 With the help of friendly aborigines they had walked and paddled across Moreton Bay, and followed the coastline north to Bribie. Pamphlett lived with the Joondoobarrie as one of them until Oxley found him. 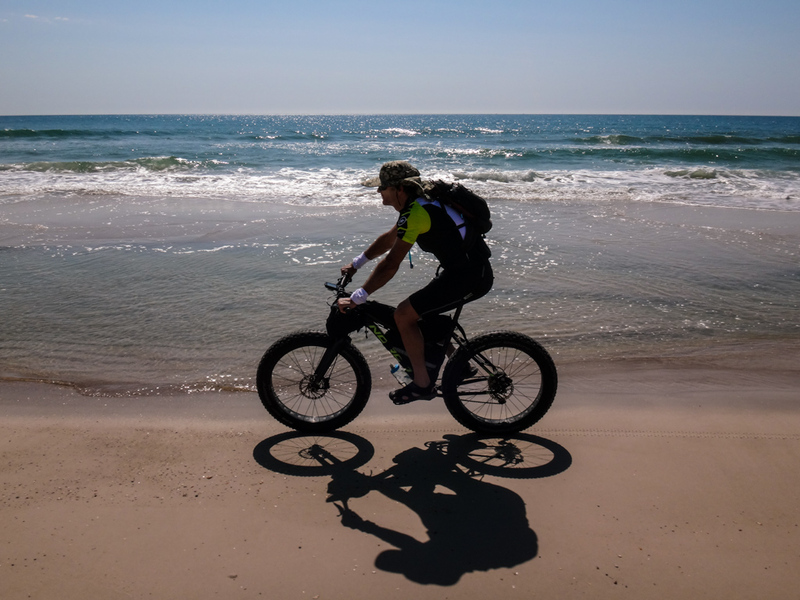 Riding on the beach is a bit different from riding on a forest track or a paved road. This means you don’t get a break from pedalling. It’s a constant effort all day. The trick is to get into a rhythm, and not push yourself too hard. 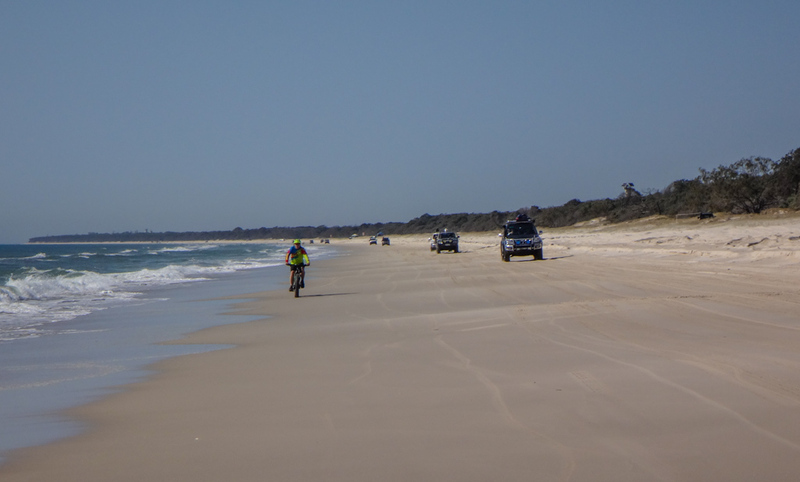 As we progressed further up the beach we had to share the “road” with other vehicles. Unlike riding on the road, we kept as close as possible to the water, even if it meant riding to the right of oncoming traffic. The other vehicles seemed to understand and gave us wide berth. 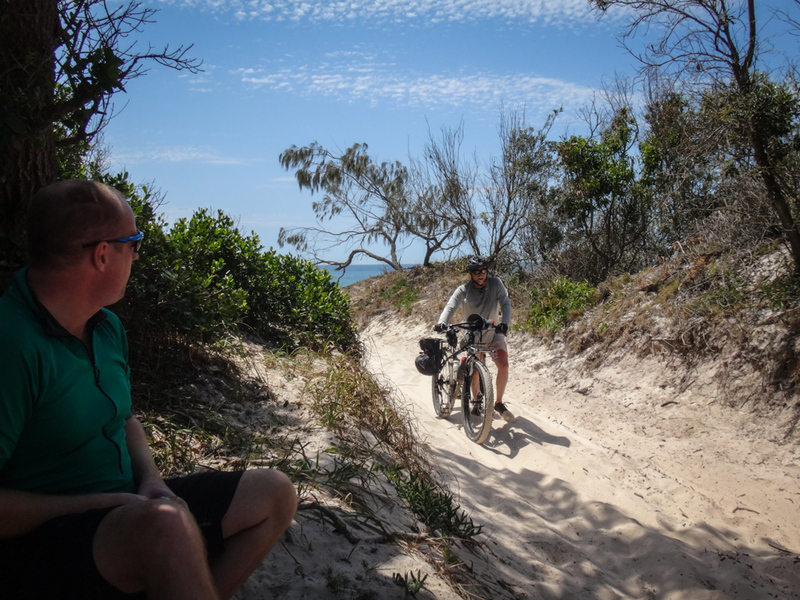 With a gentle wind at our backs, we rode northwards up the beach towards Caloundra. 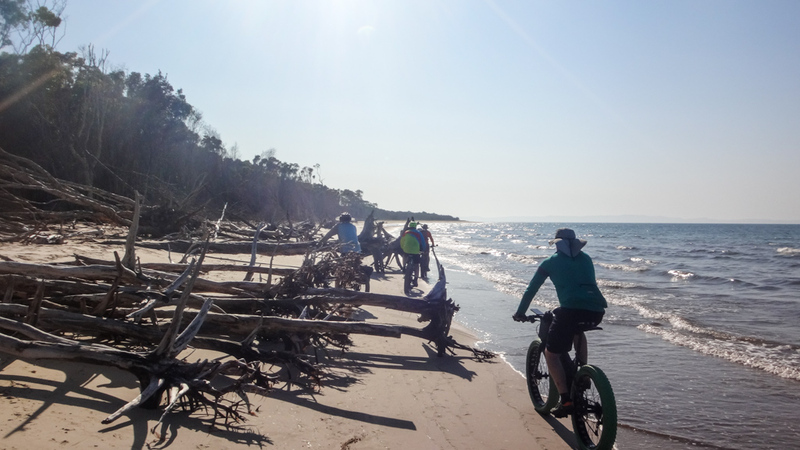 It’s almost forty kilometres from Bongaree along the beach to the northernmost point of the island. 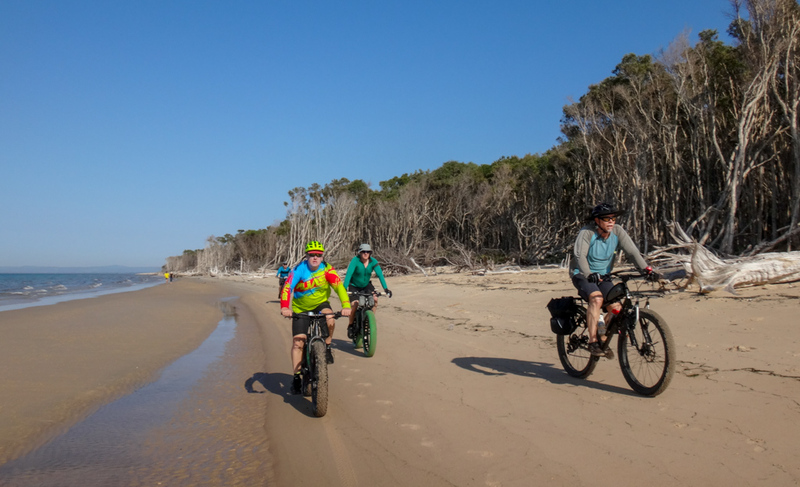 A return trip of eighty kilometres would be too far to ride in the six hours available during a normal tidal cycle, especially considering we’d be riding into the wind on the way back. …but mostly we just enjoyed the ride. 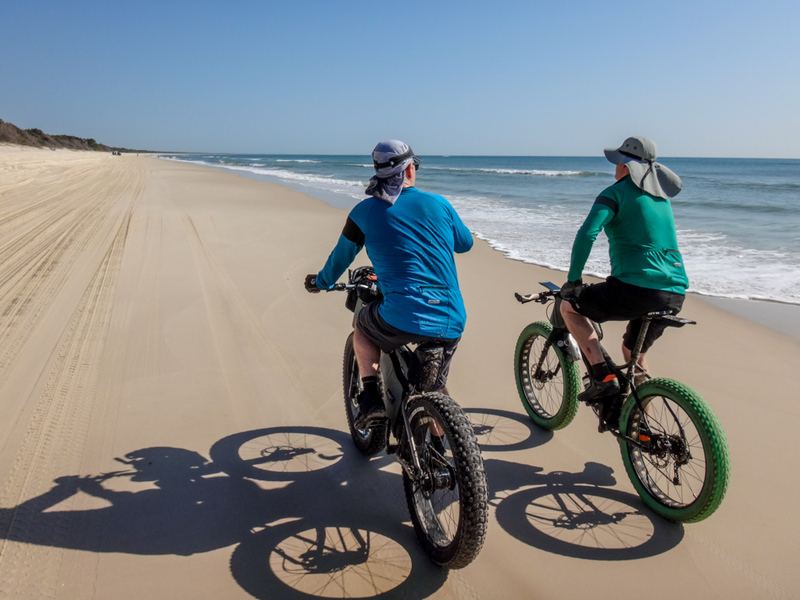 Beach riding isn’t about deadlines and goals – it’s about enjoying ocean, and the feeling of sand under your tyres. We stopped by the side of the “road” after a couple of hours and had a quick snack. This far north on the island there were no large trees under which we could shelter, so we just relaxed in the sun. The tide had bottomed out and was now rising. 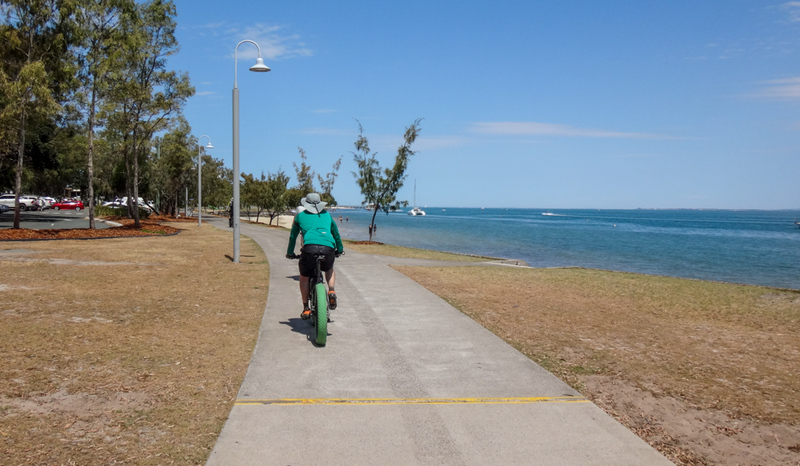 With Caloundra and the northern tip in sight, we decided to turn around. Jason preferred to go for a swim while we rolled back down the beach. He was a fast rider and could easily catch us. 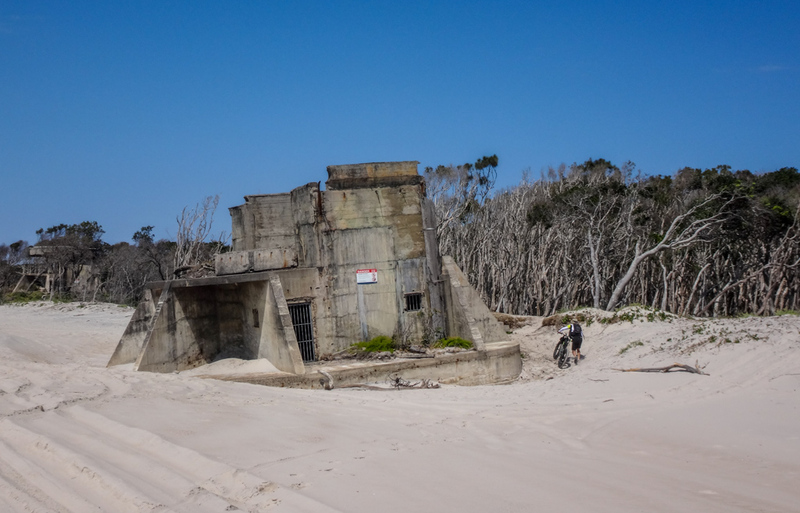 We stopped at Fort Bribie to admire the old military buildings. Seventy years ago they bustled with nervous soldiers looking out over the bay. Today they looked like rundown beach apartments. The wind started to pick up as we retraced our tracks. We agreed it would be best to take the inland track back when we had the chance. 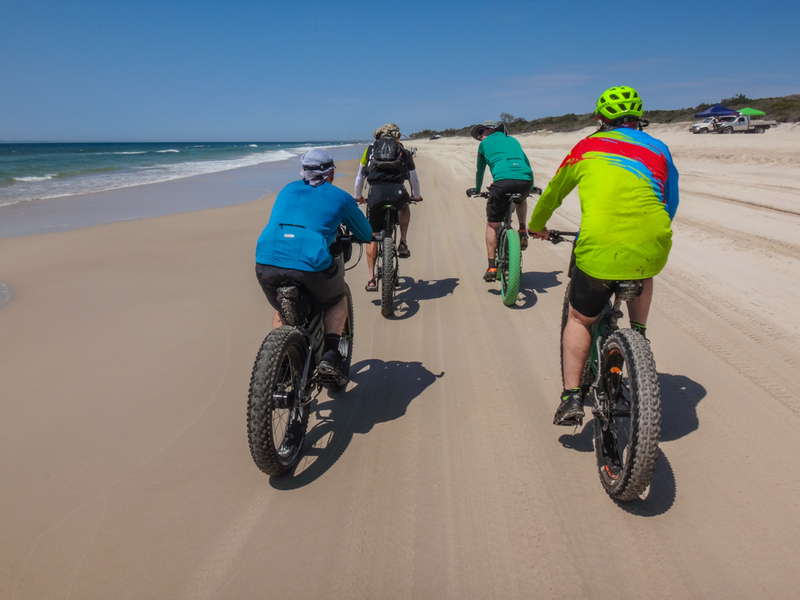 Although it’s reasonably easy to ride a fat bike on wet sand, it’s difficult to ride on deep soft stuff. 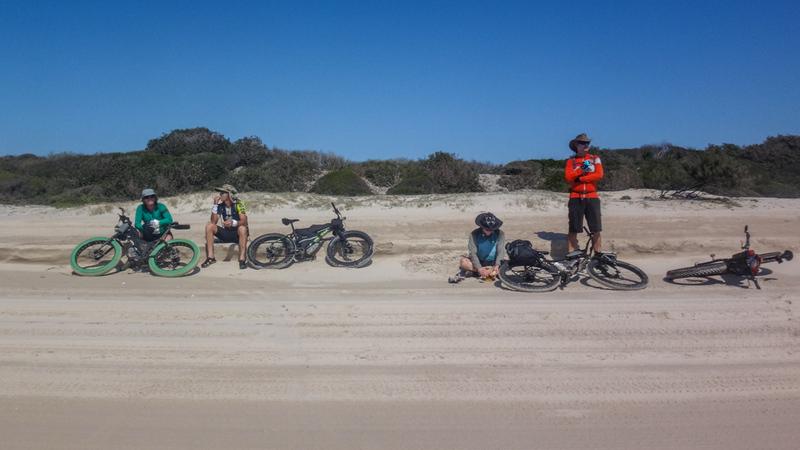 We dismounted and pushed over the dunes into the shade. 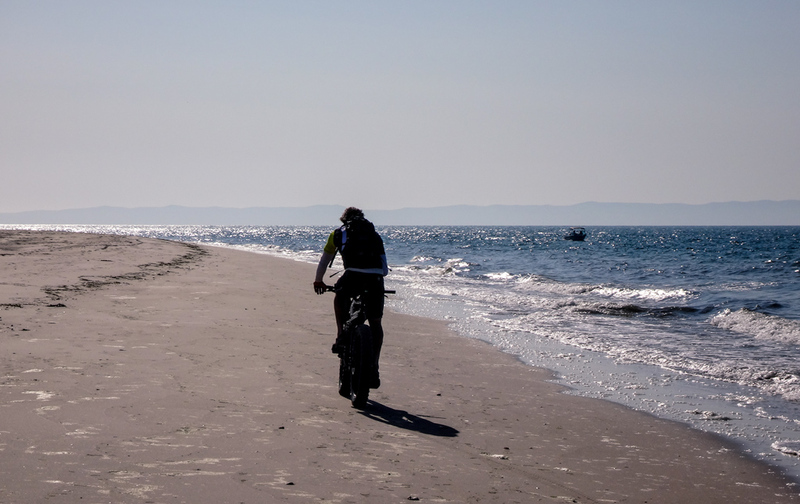 The sand was softer here, but there was little wind, and no waves to worry about. 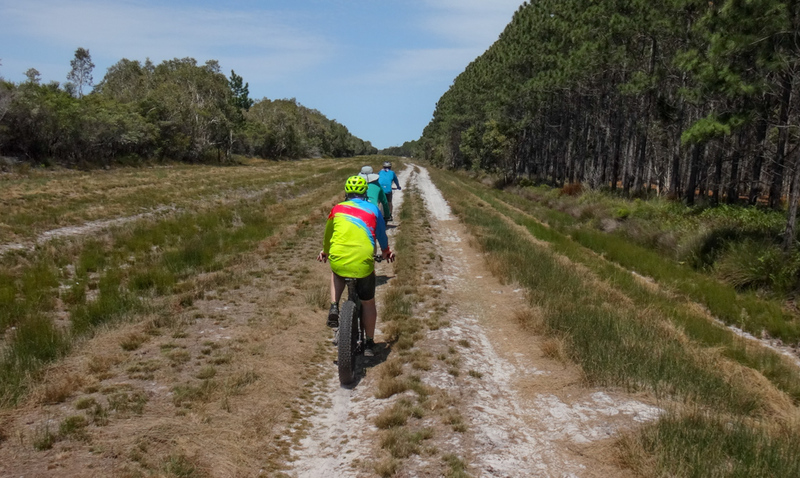 We rode south alongside pine plantations. 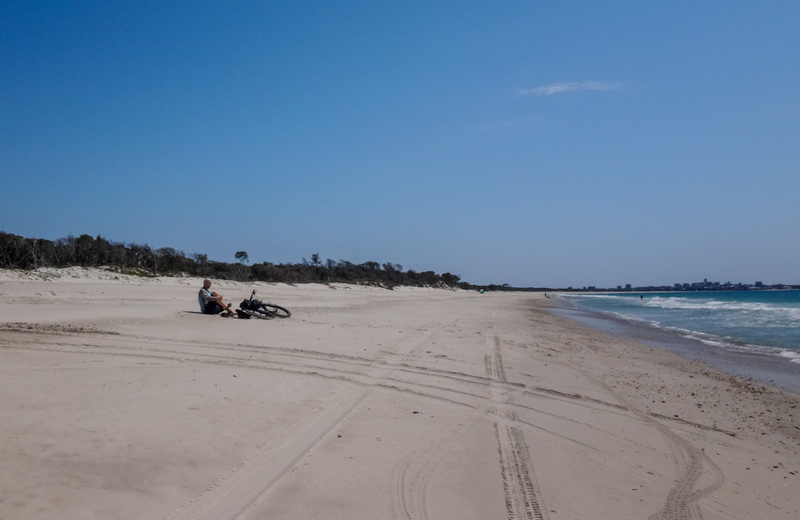 In some places we steered onto the grass to avoid some of the softer drifts of sand. 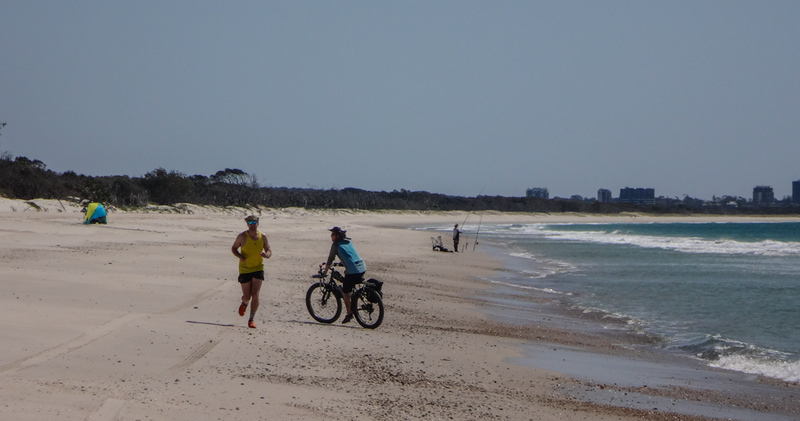 The sand disappeared, and we found ourselves coasting along a quiet grass track. We had completed the hard work and were now able to take it easy. 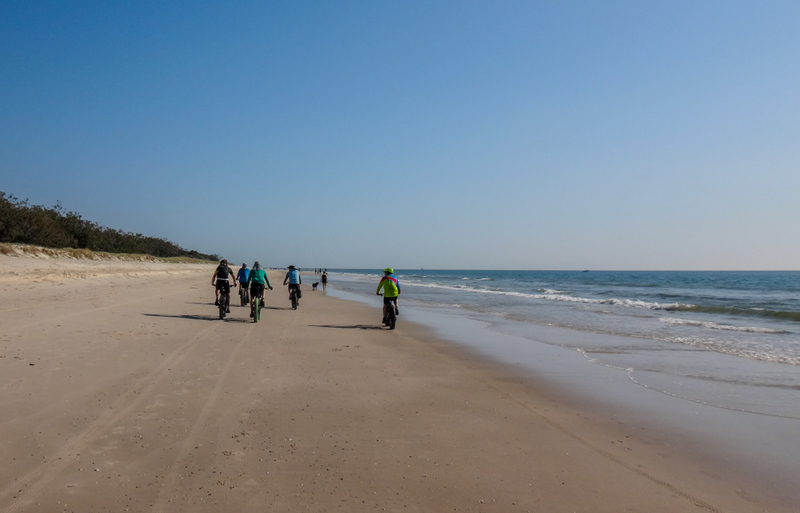 Back on the western side of the island, we followed bike tracks along the beach back to the start. 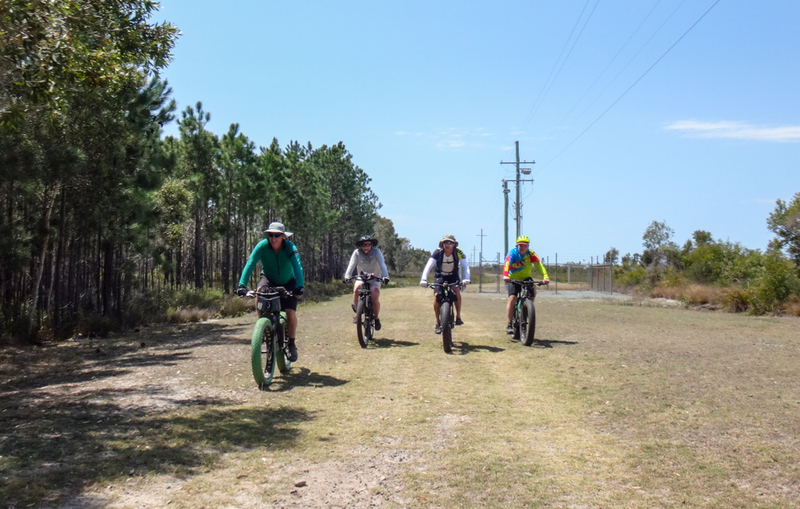 We rode about 65 kilometres in five hours. Although there was almost no elevation change during the ride, I still managed to burn about 2,500 kcal. 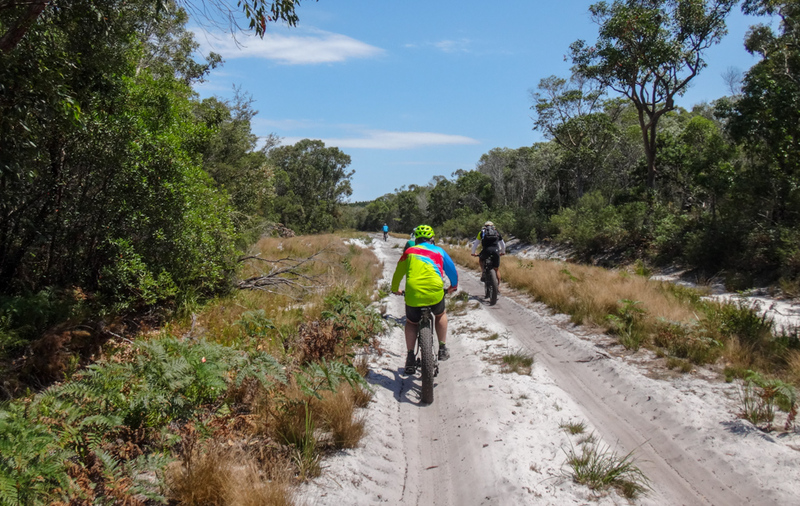 This was a pleasant ride on a reasonably warm day, but we still had to work quite hard to cover the distance.